Middlesbrough defender Tomas Kalas says a defeat against Preston on Saturday would "destroy everything" after their recent good run. Boro have won the most games in the Championship and have not lost a league game at the Riverside since January. 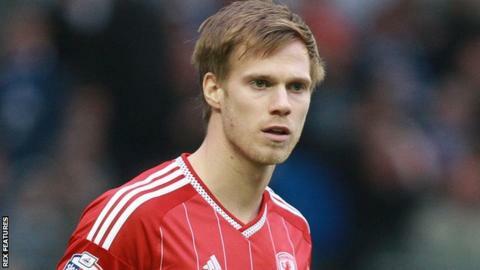 "When we play at home we know we've got the advantage against the other teams we are playing," Kalas told BBC Tees. "For three home games we have started pretty well but we can destroy everything if we lose the next game." He added: "We feel the fans are standing behind us and now we notice it even more. We are really pleased and thankful." The 22-year-old, on loan from Premier League side Chelsea, has impressed for Middlesbrough this season. "Sometimes it's better when I am under pressure and challenging myself to keep my position in the first XI - that's what all players need," he said. "I was struggling on the bench when we had gone nine games without conceding. Obviously I was happy for the team but for myself it wasn't the best. Now I am trying to keep everyone out of my position."